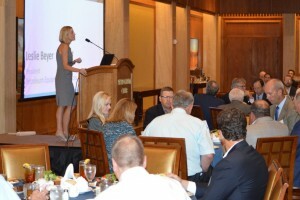 On September 15, PESA hosted a joint luncheon with the Permian Basin Petroleum Association (PBPA) featuring keynote speaker Jim Wicklund, Managing Director of Credit Suisse. 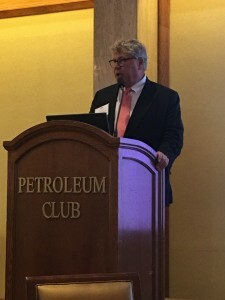 Wicklund addressed the current economic climate and what that means for the industry, focusing on the growing importance of the Permian Basin. As the Permian Basin continues to develop, PESA is determined to elevate its presence in the region to better serve its members. “I believe that collaboration between PESA, the unified voice of the service, supply and manufacturing sector and PBPA, an advocate for oil and gas development throughout the Permian Basin, will provide added value, especially to our shared members operating in the region,” stated PESA President Leslie Beyer. Wicklund believes moving forward, the Permian Basin will be the most important basin in the world. It is currently producing 2 billion barrels per day and he expects that to double over the next two years. Although the land rig count recently exceeded 500 for the first time since March, it is still significantly down from 1,925 in 2014 and recent technological innovation has allowed increased production that will require fewer rigs and fewer people in the future. “It is becoming increasingly clear that as rig efficiency improves, pad drilling accelerates, and completion intensity moves up, fewer wells than previously expected will be needed to meet future production growth requirements,” stated Wicklund. Wicklund estimates, with the rig count down 80 percent over the past 20 months, fewer than half of the idle rigs will go back to work. Meaning many of the 350,000 jobs lost will not return. A focus on lean operations led to the utilization of computer models, upgraded techniques and streamlined processes. The field-based jobs will return sooner but company restructuring may permanently prevent many corporate-based jobs from returning. Although he doesn’t predict $100 oil returning, Wicklund has a positive industry outlook, with the Permian Basin leading the way to recovery. With average regional production up 400 percent since 2011, he predicts it will rise another 25 percent through 2017. As PESA members drive innovation across the Permian Basin, PESA will grow its presence to better serve as a resource throughout the region.